This has been on YouTube for a few days..I combined a Quick Draw Mc Graw Photo slide with the vintage 1960's WEWS Station ID to create a promo-station ID, voiced by the late Ron Penfound-This would be just before 12 Noon Friday,May 24, 1963..The Quick Draw slide would probably have been in Black and White, as Channel 5 didnt have many programs in color till 1965..
Sealtest Commercial with "Mr. 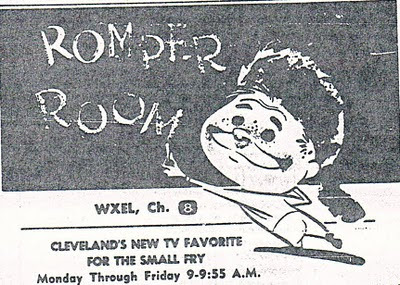 Cool"
Tried to find slides appropriate to the content-About as close as you'll come to the "real" content without finding the actual video..Thanks to friend Dan O' Shannon for the audio clips..
TV Guide February 1956-Not generally known or remembered is that "Romper Room" got its start in Cleveland at WXEL Channel 8 in 1955-56..I believe I read somewhere that Miss Pat Ryan Dopp may have been the teacher then..Notice the then-popular coonskin cap from Disney's "Davy Crockett"
It is with great sadness that we report the passing of Mrs. Barbara Plummer. 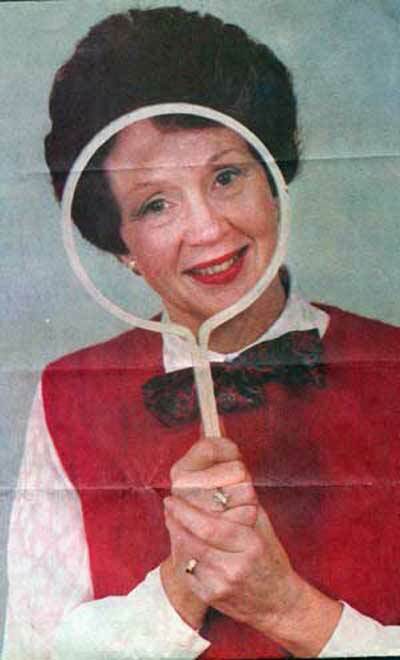 Known as "Miss Barbara" the morning teacher to hundreds of thousands of Northeast Ohio youngsters in the franchised "Romper Room" school..Mrs. Plummer died Saturday, March 20 at the age of 80 from the effects of cancer and pneumonia..survived by her husband, Mr. Gordon C. Plummer, two children and two grandchildren..
After a brief run in 1955-56 on WXEL-Channel 8, WEWS-Channel 5 acquired the Romper Room Franchise starting in 1958 with Norwalk native Mrs. Plummer as teacher..and aired Romper Room all the way till 1971..Mrs. Plummer was also very active in civic and community groups throughout her time in Cleveland..Our condolences to the family at this time.. Here is a link to The Ohio Media Watch coverage of the story, which is where we first heard about it last night.. 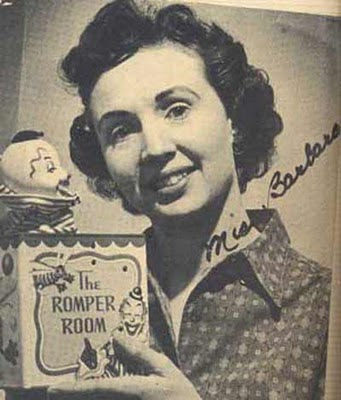 In addition to "Romper Room" Miss Barbara also occasionally did the weather forecast, sub-hosted for "Paige Palmer" and was "Story Lady" on "Captain Penny"
Interview with Barbara Plummer-WEWS 50th anniversary..
Don Webster memories..at 6:01 Barbara Plummer does the current weather replacing Susan Davies for the segment.. The blog is authored by Michael J. Hayde, known as a TV historian and author, who has written books on the histories of Jack Webb/Dragnet and The Adventures of Superman..He also had contibuted Commemtaries to some of the Adventures of Superman DVD set and has appeared on Sirus/XM Radio with Old Time Radio Host Greg Bell. Great New Local TV find.. 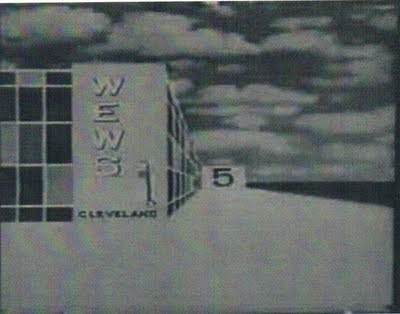 Copy of the "Classic" TV 5 station ID Logo from the 1960's-From a screencap of the opening to "Cleveland Comedy Company" a 1980 WEWS limited series..
2:30 Opening (30 seconds) of Jane Wyman Theater.. This person has graciously allowed me to have a copy of the programming..My thoughts from listening to it.. The 12:00 News-Paul Wilcox could fit 15 news stories and 2 commercial breaks in 10 minutes..That doesnt happen today..
One O Clock Club..Bill Gordon really ran the Show-He was the "traffic cop"..Could think on his feet-And he was so funny..Dorothy Fuldheim interacted with Bill some, but not as much as youd think..
Captain Penny-He could fit a lot in 50 minutes-The "heyday" of Kids shows-Did live commercials..
Romper Room-Miss Plummer kept the show moving-Those kids were probably tired at the end of the half hour..
My plan at some point is to share some of this here and/or possibly Facebook or YouTube..Let me stress it may take some time to do with editing, etc..This was great to listen to-A virtual "time machine" of Cleveland Television..
Wednesday, October 15, 1958-Lawrence Welk Plymouth Show..Unique in the broadcast is "stereo"..If one tuned their AM radios to WAKR-1590 and WSRS-1490 along with watching on TV, they could hear the music in stereo.. 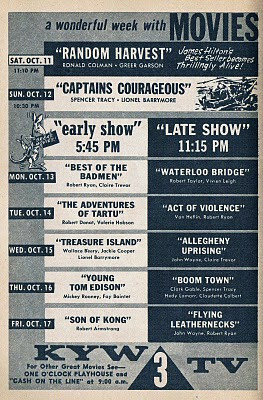 Here's what I think is a great ad..KYW-TV Movie choices Oct. 11-17, 1958-KYW aired four movies a day Mon.-Fri.. 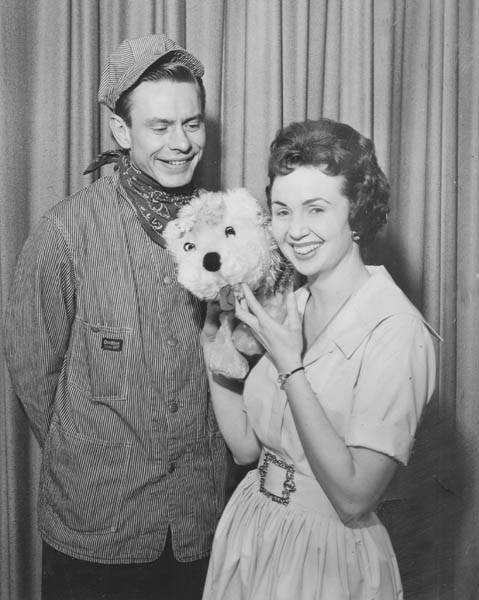 The lovely Darlene Kane-Co-hostess with Phil McLean on Channel 8's "Bandstand" Popular music show in the late 1950's. 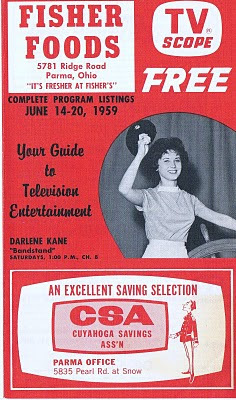 "TV Scope" was a free TV Guide available at Fisher Foods Cleveland locations, and possibly other stores in Northeast Ohio. 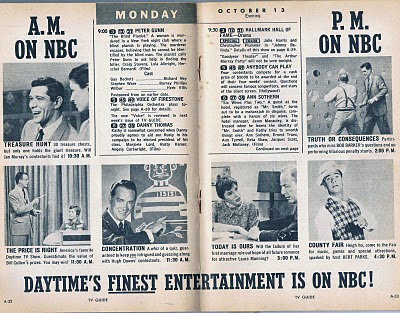 Today, let's look at The week of October 11-17, 1958.. Sat. 2:30 Ch. 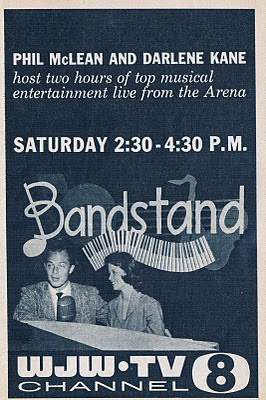 8 Bandstand-Phil McLean and Darlene Kane host a special live broadcast from Cleveland Arena. Sat. 9:30 3-21 Cimarron City-DEBUT-Starring George Montgomery-Guest Star Fred Mac Murray..
12:30 AM 3 Credo-Interfaith sermon at signoff-Channel 3 used this title into the 1980's at least..
Sun. 2:30 Ch. 12 Erie NBA Basketball Exhibition Phila. Warriors at St. Louis Hawks-NBC Telecast-3 did not carry this..
Sun. 4:30 Ch. 3 Fun With Charades-Big Wilson-Show moves to Channel 3 after several years at Channel 5..Teams:Shaker Heights B'nai B'rith and Euclid Little Theatre..
Sun. 9:30 Ch. 5 Debut of the syndicated How to Marry a Millionaire..Including a young Barbara Eden as one of the stars..
Mon. 11AM 45-49 ABC's first daytime weekday schedule begins..
10AM Western Movies-"Bandits of Dark Canyon" and "Timber Trail"
As I mentioned a few weeks ago, Jim Vickers, Managing Editor of Cleveland Magazine emailed me for an interview about the blog..Below is the result..Part of the "City Life" column..
Tim Lones reruns media memories on the Web. It’s one thing to fondly recall the days of Barnaby. 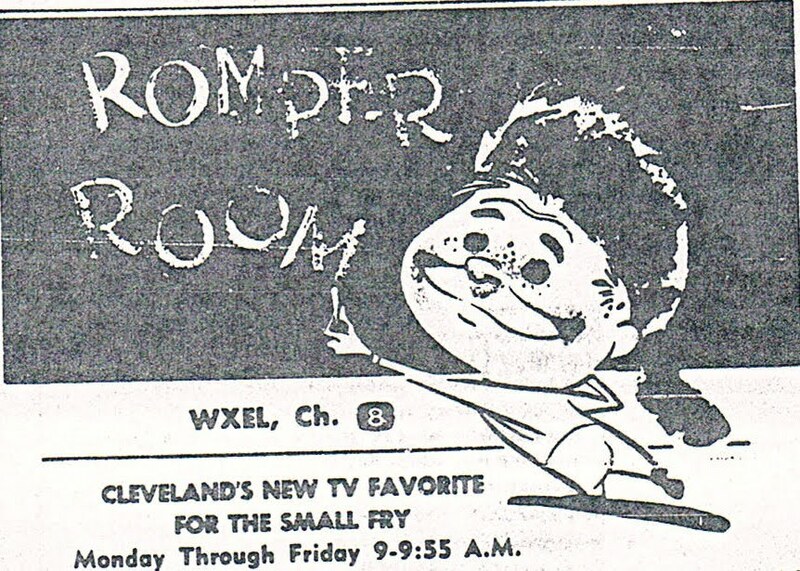 It’s quite another to dig through 35-year-old television channel lineups to remind us all that WEWS-TV5 ran Hoppity Hooper at 12:30 p.m. on June 19, 1965. In January, the 52-year-old Canton resident took Cleveland Classic Media to Facebook, where fans can now keep up with Lones’ tribute on a daily basis. I want to thank Jim Vickers and Cleveland Magazine for the interview..I appreciate the kind attention..